More on the National Geographic Decline | Watts Up With That? Anthony has covered the National Geographic Northern Hemisphere temperature graph here. This is the graph under discussion. Since I’m a suspicious guy who never takes anything on faith, I went and got the original data that was used by National Geographic. According to Joanne Nova, the early part of the record is from Budyko, and the latter part from Angell and Korshover. I digitized the data from the original documents. I was able to replicate the National Geographic graph quite closely. Figure 2. 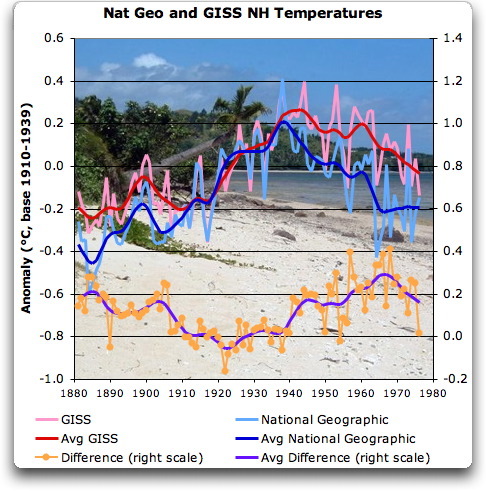 (Upper) Data from November 1976 National Geographic article, and GISS temperature data. Both datasets are for the Northern Hemisphere. (Lower) Difference between the two datasets (right scale). A few notes, in no particular order. 1. Most of the ~ 0.2°C difference between the NatGeo and Giss data in the recent record is likely from the 1941 sea surface temperature (SST) adjustment. See here, here, and here for discussion of this adjustment. There is an abrupt jump 1940-1941. 2. For the middle part of the record, they track each other pretty closely. 3. There is another adjustment, again of ~ 0.2°C ,for unknown reasons, in the period from the start of the record to 1906. Again, there is an abrupt drop 1906-1907. FIgure 2. Residual Sum of Squares Discontinuity Analysis. The breaks at 1906 and 1941 are clearly shown by this method of analysis. So we have two major adjustments of ~ 0.2°C, for one of which we likely know the justification, and for the other, I have no idea. Bob Tisdale has an article about the 1945 SST drop, being recognizable also in other datasets (marine air temperature and wind speed). Increase 1900 – 1945 and decline to previous levels is visible also in Armagh and CET record and in US temperature record as well. Is there any indication that these authors used SST? This may be relevant to the marine adjustment. Should the comparison not be with a Land-only index? I can bet the first adjustement is for making the graph to look like there is an unprecedent warming :). Just anecodottal photograph data from the Lion Inn, N. Yorkshire, last weekend after peat coring. The photographs of snow accumulation are massive, in the order of 4 metres (v. high for the north of England uplands, highest on record for the 20th Cent. I would guess). This fits well with the dark-blue, unsmoothed old National Geographic data as opposed to the further adjusted (!) GISS. Bruce M. Albert, Durham U. That would be 1963 (above). However you want to interpret it, surely the graphs illustrate an important side issue-the the temperatures to the end of the graph in 1976 had been in decline for some years, and in consequence Arctic ice would have been at high levels following to well documented melting in the 1930’s. The satellite records commenced in 1979 from this historically high point and since then we have been recording another of the down turns which seem to occur with considerable regularity throughout history-the most famous being the MWP. Would you agree with this analysis and the coincidence of Satellite readings and maximum ice? Indeed. See the Polyakov record of Arctic temperatures here, update 10. The GISS data used SST, Angell used radiosonde data, and Budyko did not specify but presumably used land stations only. It would seem that MWP was not the only problem playing on the minds of the current crop of climate scientists(?). 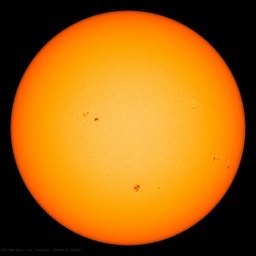 Successive adjustments to the raw data has practically eliminated the global cooling of the 50s, 60s and 70s, which instigated the New Ice Age scare of the last century, in order to present the current case for unprecedented warming of the Global Warming scare. We may now have an explanation for the ‘divergence’ problem. Maybe trees are good thermometers after all. Maybe the warming of the 1930s and 40s is similar today. Maybe climate scientists were unbelieving of the story the actual data was telling, and simply adjusted and cherry-picked the data to suit the AGW hypothesis. It would appear that scare stories of an impending Ice Age and runaway Global Warming were just that, scare stories. It would seem that the current crop of scientists have fallen into the trap of employing cargo cult science – they had to fool themselves first before they could fool others. This is another BLACK DAY for science. The very many excellent articles that are written do tend to be a five minute wonder as another one quickly comes along to take its place. Do you know of anywhere on the web where articles on say sea ice levels, or Co2 concentrations, or other specific topics, are logically grouped together so they can be easily read in one place without getting into all sorts of side issues? I have been reading Frank Lansners blog for the first time and he is one of many who, like you and others I am too modest to mention, write well researched articles that subsequently disappear from view. Willis: To confirm, the “Folland adjustment” would show up as the difference between the COADS SST data and the HADISST data for the Northern Hemisphere. It does explain part of the difference between the GISS and the National Geographic curves prior to 1941. Any later SST adjustments do not explain the difference after 1941. This is the problem with paper records, digital ones can be amended to purpose, paper not so much. I have the DVD archive of National Geographic and will try to look for more good articles. Sorry about this, but you must have been expecting me to appear, teeth shining, frothing at the mouth, hands waving furiously and with eyes going round faster than a recycled carbon credit. Why the blip indeed? This is where science advances, by noticing discrepancies which do not fit the perceived picture: the precession of Mercury; the strange coincidence of fossils across oceans; the failure of a heavy cannon ball to fall much faster than a smaller one. A scientist should greet a discrepancy with cries of joy, something to use to make a name! But no, climate science adjusts it away. Is it just me or is there a touch of wistfulness about that ‘why the blip’, some tiny inward proper scientist who would love to chase truth rather than the consensus? While it is nice to see a refutation of the bucket correction, it is surprising that there is no attempt to calibrate SSTs against exposed coastal weather stations. The failure of Folland and Parker to match e.g. Valentia’s record is obvious. There must be a chain of such stations, able to indicate trends if not actual temperatures — the Azores, Canaries, Bermuda etc in the Atlantic for example. The trends should be good enough to demonstrate the error in the assumptions behind the correction. Where the calibrating stations are airfields, there should be good cloud data as well — aircrew are rather keen on knowing about low cloud over their runway. However, removing F&P not only removes the unexplained fall in temperatures from ‘41 onwards, it generates a large hump starting in 1939 (see graphs of bucket correction in this blog). Then we have the problem of explaining that hump. What do the statistics say about an excursion of .5 deg above the steady trend line from 1910 to present? That’s a remarkable el Nino. That blip niggled me. It stood out clearly on the Hadcrut graphs, even though their scale had been chosen to make it look insignificant by pushing its peak near the zero line. Then the graphs changed, the warming, initially sharp in 1939/40, smeared out to become a gradual rise from 1935 onwards and, because the same rise was extended in time, it looked much less dramatic, much less in need of explanation. Fudge, it was obviously being fudged — I didn’t know about the arbitrary adjustments that could be made, not being privy to the above email, but it looked very odd. Why hide the blip? Because they could not explain it. There are other problems with climate science: why does the isotope signal for human CO2 emissions start in 1750? Why does warming in the period from 1910 to 1940 match that from 1975 to 2005? (Yes, ish, eyeball stuff, but Tamino kindly calculated the CO2 forcing for the two periods, 0.25 w/m^2 and 2 w/m^2, more-or-less the same warming but eight times the forcing. Apparently I was using the wrong data or something and it’s not a problem, move along) The consensus theory is very simplistic, CO2 in, warming out. But what about biology? What else are we doing to the planet that might have world-wide effects from a small input? The FAO have somewhere on the web a graph of surface wind speed over the oceans — they have an effect on ocean fertility — and the 1939/45 period stands out clearly, with the biggest effect, about seven metres/sec increase, occurring in the Atlantic. What slows the wind over the ocean? Engagement with the surface. What could reduce that? Smoothed surfaces, surfaces which fail to ruffle when blown upon, surfaces polluted with oil. I checked the history books — yes, there were several documented large oil spills in the Atlantic during that period. And the Pacific too. Older readers might have read about it or even fought in it. So was born The Kriegesmarine Hypothesis: massive oil spills polluted the surface and smoothed whole oceans. Smooth water has a lower albedo than rough, polluted water will evaporate less, so the surface will warm. Smoothed waves break less often and produce many fewer salt water droplets, fewer droplets, fewer cloud condensation nuclei (CCNs) so — bingo! — fewer low level clouds. Fewer clouds, less warming. Smoother water, fewer bubbles driven down into the depths, less absorption, less CO2 pull down. Less CO2 in the water, fewer plankton, less export of CO2 to the deep ocean via dead plankton. Plankton in fertile waters preferentially use C12, so fewer plankton means less pull down of C12 from the air: C12 signal goes up and CO2 amount goes up. The disengagement of wind from the surface and the warming of the surface reduce upwelling which means the surface waters become depleted of nutrients. Many starvation-tolerant species of plankton use C4 metabolism which discriminates less against C13: their bodies drift down carrying a higher amount of C13 compared with their C3 cousins, the pull down of C13 increases leaving more C12 in the atmosphere. Ruffled water has a higher emissivity than smooth, so that explained the preferential warming of the Arctic: during darkness it was cooling slower that the historical rate and the effect would be enhanced by the slow breakdown of oil in the icy waters. It was a game, a game of seeing how many effects one could plausibly attribute to oil spill. I was pleased with the result: everything except the population crash of cod on the Grand Banks by the look of it. So, that explained the blip. AGW was still real, no problem there, because wartime oil spills stopped in 1946. Not entirely, of course, leaking wrecks would have been bubbling up oil for years and the post war industrial boom would be pushing gallons of waste oil down the sewers. So I checked on that. Enough oil comes down the sewers onto the ocean to coat the entire surface every two weeks. (I did the calculations using the observations made by Benjamin Franklin on a Clapham Common pond: all science is one.) Then I read about Tide, the first synthetic detergent. Contrary to expectations, surfactants smooth water and have the same effects as oil. The new detergents are also resistant to bio-breakdown. It was worse than I thought. Maybe AGW was real after all, and caused by Big Oil and Big Surfactant, but it was nothing to do with CO2 at all. CO2 is a feedback, not a forcing. Here I got a bit carried away. The joke had lost its savour — wouldn’t it be terrible if I was right? I emailed a couple of big names and got very nice replies, reassuring me that the Kriegesmarine Effect was too small to make a difference. (As an aside, isn’t it strange how the AGW proponents are so rude and those on the sceptic side (ie the real scientists) are polite and tolerant of even the oddest questions? Anyway…) That was reassuring until I read Latham and Salter’s paper about their cloud ships. Tiny amounts of seawater could be broken down into droplets and pumped out to make CCNs, amounts that would be dwarfed by the changes that surface pollution could cause. If the cloud ships work then so does the Kriegesmarine Effect. Biology controls its environment. Plankton emit di-methyl sulphide to make CCNs. Has the oil/surfactant pollution damaged this system? I find that diatoms release little DMS and there are hints that the C4 types are not so good at it, but that’s a tentative suggestion. When an ice-floe melts it ruins the lives of all the stuff growing underneath. Do they try to release cloud makers to keep the sun off? Has the amount of dissolved silica from farming run-off changed the plankton populations, replacing calciferous types with diatoms which are less reflective and less C12 discriminatory? Have we disrupted the atmospheric boundary layer, that couple of thousand feet above the ocean surface as well as the oceanic boundary layer, that few microns of oil and biology, surfactant and debris where air and water meet? Do we understand the physics of an oil or surfactant contaminated cloud droplets? Why are radiolarian skeletons becoming more fragile? Have we reduced the numbers of Ameliania huxleyi enough to change the ocean’s albedo? What do eel fry feed on? So many blips, so much more to find — the answer to the problems of climate change is research, massive amounts of it. Can I defend the above speculation? Not really, not with any rigor because I don’t think the answers are out there. Cleaning up the sewers wouldn’t be a bad thing to do anyway, so it’s worth doing that. If it cools things then it would be a bonus. It really needs to be taken seriously: I’ve sat on a hillside in Tenerife and seen the Atlantic smoothed in a broad swathe as far as the eye could see by the sewage run-off from one tiny town. “Action on climate is justified, not because the science is certain, but precisely because it is not” The Economist. They’ll obviously be backing a response to the Kriegesmarine Effect. Less fog in San Francisco? Fewer CCNs, not ocean warming. Why the blip? Spilled oil. The cod? Diatoms are silica limited but very efficient competitors. They are being fed more silica from NA agriculture run-off and are suppressing the phytoplankton on which the fry feed. Now that’s what I call an hypothesis! My eyes and my wrists ache…. Willis: Regarding the difference between the GISS and the National Geographic curves from 1941 to 1975, when did GISS add the Arctic to their Northern Hemipshere data and when did they add the 1200km smoothing? What did it happend in 1941? Here is a chart Phil Jones presented at a conference at NCAR last summer. It shows the different temperature reconstructions made by various climatologists/meteorologists over time [most names you would have heard of before]. I don’t know if it has been Jones’ed and it is just a curiousity I guess. Just noting as well that the early SST measurements pre-1900 from Ships were adjusted up by a large amount (there must have been some measurement/instrument problem for the time). Looks like Brohan et al is the problem. I’d give him an “F” and send a note home to his mother that he just sits in class drawing dashed line pictures and looking out the window. But it dows look like he’s found his nitch, doesn’t it? values) to create the first difference reference series. “it was assumed”, what for all cases regardless of whether there was problem or not, can you imagine how this works using stations up to 1200Km away? What a way to treat data. There was a change in the way they measured sea surface temperatures. The following is a quote from Folland and Parker (1994), CORRECTION OF INSTRUMENTAL BIASES IN HISTORICAL SEA SURFACE TEMPERATURE DATA. Willis, I forgot a question in my (04:43:44) comment (It was early). Did the National Geographic dataset include the Arctic? The article which must not be mentioned. Julian Flood (04:01:46) : Are you against Big Oil? ☺. Then I read about Tide, the first synthetic detergent..
“The very many excellent articles that are written do tend to be a five minute wonder as another one quickly comes along to take its place. Do you know of anywhere on the web where articles on say sea ice levels, or Co2 concentrations, or other specific topics, are logically grouped together so they can be easily read in one place without getting into all sorts of side issues? I contribute to http://www.co2science.org regularly. They have an excellent grouping – by topic – of several hundred related science papers: Unlike WattsUp, the format is to present a new web page weekly, each web page highlighting four to eight papers and an abstract (and criticism, if needed) of each paper. Regular topics are CO2 levels and their improvement in plant life, temperature itself, and sea ice. Their index is very good, but large. Folland’s speculation appears to be wrong. According to this picture, inlet measurements have become the predominant type of measurement only since he 1990s. This makes the massive pre-1941 downward correction invalid. It may even explain part of the temperature increase in the 1990s. this error/manipulation is important and the resulting warming bias bigger than any other misadjustment. That was a very interesting composite graph and I do think its significant. In several of my recent articles I have looked at climate over an extended period and commented on the extraordinary coincidence that caused Hansen to run Giss from 1880. Logically it was not a good date to start as it didn’t give him the coverage in depth he said he wanted. However it did commence from a distinct down turn in temperatures which meant that any subsequent upturn was accentuated because it was coming from a trough. Jones did the same in as much he also measured from a trough, but in his case I think it was purely because he wanted early coverage, rather than extensive coverage. Measuring from a peak rather than a trough will considerably change the shape of the subsequent slope and I think several of Hansens competitors pick up the peaks and troughs much beetter than he does. Personally the further back in time the better as far as I am concerned, looking at say the CET and Uppsala figures for example is quite instructive. Thanks to RACookPE1978 (07:54:36) : for citing CO2 science in response to my earlier comment. Yes it is very good, but I personally find it very unwieldy and too complex to navigate and also tend to associate it mainly with its excellent work on the MWP which is very focussed. I will give it another go. Nicola Scafetta on his recent Science and Public Policy review of sceptical science referenced the Russian book. There is a way to obtain a list of links to articles in particular categories on this site. Click on the “Categories” pop-up scroll-list toward the bottom of the sidebar to see a list of articles relating to about 20-some topics. I suggest that all the categories be visible on the sidebar without requiring a click to view them (if WordPress will allow this), as I suspect that this feature is overlooked by many site visitors — and even regulars. This site has made a start toward an informal indexing of worthy web-wide articles on one topic: Climategate, under the tab of that name. Perhaps this site could set up a new tab for all other topics, subdivided internally by category, to which regulars here could make contributions. It looks like GISS has about the same slope as the National Geographic data. No conspiracy here. Not if they pay enough. Here I am presenting an entirely new way of looking at climate change. The least they could do is pay me a consultant’s fee of ginormous wads. Them too. I am generous in my acceptance of enormous wads. Prizes. Tropical islands. Floozies. Aston Martins. You mean someone else has noticed that biology responds to climate? And vice versa. Whatever next? Aha. I didn’t know that. So we can blame the Germans. I have a subtheory that it’s all to do with mauve, the waste products of the chemical industry setting off the effect. Germans again, of course. But how were they to know? I can now cross off ‘save the world’ from my to do list in the pantry. Hoovering next. Yes, I am aware of the archiving system here, but again have never found it particularly coherent if you are seeking specific topics. Also, there are many good papers which never get picked up here for one reason or another, so I am talking about a central resource and index for ALL sceptical blogs. What you say here is VERY pertinent! “This site has made a start toward an informal indexing of worthy web-wide articles on one topic: Climategate, under the tab of that name. Perhaps this site could set up a new tab for all other topics, subdivided internally by category, to which regulars here could make contributions. As you rightly say, if the sceptics were as well funded as others think we are we would have an easy to search facility like this already AND be paying sceptics to write articles on topics that followed a master plan which identifed weaknesses in the AGW case. Check the subject index on the Idso’s site for scientific articles grouped by subject. Regarding blog posts, there’s just Google … oh, and the subject index on ClimateAudit. I will graciously accept the role of vice-assistant chief cat-hearder, since “I” am eminently qualified – having actually heard of cats. And at only a mere 1.5 million a year! Dunno. I give the links to the articles used by NGeo, check them and see what you think. They are not all that specific. Thanks to RACookPE1978 (12:19:14) for the offer to be my Vacch, but you can’t be any good can you if you will accept such a low wage? I’m afraid to say that I believe you’re in this only for the highly prestigious title 🙂 Next. Willis; Thanks for your link I will check it out and also thanks for the excellent graphs.. It seems to cover ‘papers’ so the blog posts -which tend to be more current and more accessible to the undecided- still doesn’t have an obvious site anywhere. WUWT seems to be a natural home if it included all relevant material. Frank Lansner is probably the one responsible for bringing about the splash of the 0,43C decline displayed in the National Geographic 1976 curve (NGT76). This decline is likely to be spuriously inflated simply by the splicing of the two dataset (Budyko 1969 and Angell-Korshover 1977) used for the NGT76. The coherent Russian NH dataset for the whole time series shows a decline of only 0,28C – just 0,04C more than the 0,24C displayed in GISS. We had the issue up on our Danish Climate Debate page some weeks ago where Dr. Bo Møllesøe Vinther of the Niels Bohr Institute in Copenhagen set the record quite straight in a series of responses. “NGT76 shows a decline of about 0.43C in average temperatures between 1935-44 and 1964-73. However, since it consists of two types of temperature observations, the uncertainty is both unknown and potentially large. [How the actual splicing for NGT76 was carried out has never been published] This can be seen from the fact that the data in fig. 8 in Angell and Korshover (1977) show a difference in the mean temperatures for the interval of 1964-68 between the Budyko-Asakura curve and the Angell-Korshover curve, the former being about 0.07C warmer than the latter in this interval. Such a difference has a direct influence on the size of the subsequently calculated decline of the compound curve. If you want to assess the trend 1940-75 by a Russian dataset, I would recommend the data from State Hydrological Institute i St. Petersbourg, where M.I. Budyko headed the cimate department for many years. The below link is updated until 1993 and has been documented in numerous publications. The decline in HadCRUT3 NH temperature is 0.19C (the difference between average temp. 1936-45 and 1967-76). The decline in GISS NH temperatur er 0.24C (the difference between average temp. 1937-46 and 1967-76). The decline in the Russian NH temperature data is 0.28C (the difference between average temp. 1935-44 and 1963-72). (This is calculated for the warmest decade of the 1930ies/1940ies and the coldest decade of the 1960ies/1970ies for each set of data)”. With a true difference between NGT76 and GISS of a mere 0,04C, well within uncertainty, there thus appears to be no reason for assuming that any of your putative “0,2C adjustments to the GISS dataset” having taken place at all. A Russian series showing about the same warming as other series with known errors is no proof of anything. The massive adjustment of up 0.4 deg to 1941 was due to an error. Folland argued in (Folland 2001) that in 1941 measurements had swiched suddenly from buckets to intakes. This was a false assumption. Having found this error, it would be up to you or others to correct this series, find the errors in the then not matching Russian series and search for additional errors. However, with current knowledge, Northern hemisphere data is inflated of up to 0.4 deg against around 1940.
simply doesn’t pass the most obvious of tests. As I demonstrate mathematically above, there were two discontinuities in the dataset compared to GISS, one in 1906 and one in 1941. Both of these were before the 1959 splice, and there is no discontinuity at the splice, so your claim fails on even a cursory examination. First, you say “How the actual splicing for NGT76 was carried out has never been published”. However, it is very easy to determine by looking at the three datasets. Next, Dr. Vinther highlights a difference between the “Budyko-Asakura curve and the Angell-Korshover curve, the former being about 0.07C warmer than the latter in this interval [1964-68].” Since the Budyko data used by NGeo stops in 1960, how is this relevant? Many thanks, I’ll look at those datasets and get back to you. A couple last points. If you think that my “putative 0.2 adjustment to the GISS dataset” in 1941 is an illusion, you have not read the literature on the Follett SST adjustment. I would suggest that you read the links I provided above before making further uninformed claims. Finally, you are misfiring badly when you accuse me of saying a single word about “hide the decline”. I said that I thought the post-1941 difference was due to the adjustment to SSTs, and that is not hidden at all (except from you, apparently). You should read the literature before attacking. As you can see, the Russian and GISS data agree well except in the period 1942-1964. There is a discontinuity between the Russian and GISS data in 1942. The Russian decline 1939-1964 is -0.08C/decade, while the GISS decline 1938-1964 is -0.05C/decade. However, they come back together in 1976, and are almost identical from then on. “It is likely” is not enough. So i need to know exactly why it is “likely” that the JMI is significantly wrong to answer your things. Next, in Hansens later graph, theres nothing that indicates that it should be the stitch around 1959 thats the basic issue. Hansens temperatures dives STRONGLY after 1960. So the real dissagrement for example Hansen vs. Matthes occurs in trends starting around 1967. So Hansen trend from 1967 goes UP in the middle of the period 1958-75 where Korshover and the others incl Raobcore shows solid down trend. THIS IS THE EPICENTRE of differences, not the stich around 1958 that you find “likely” should be done significantly differently for some reason. We still have the problem core: CRU, GISS Goes UP 1958-1975 while peerrev original data from the real world goes DOWN! This is the main issue, so any claims about stitch 1958 is less rellevant (and not well supported). All sources agree on temperature fall 1940-58 , the “new” thing is that 1958-75 also falls significant in temperature, unlike GISS, CRU. I’m thinking about an independant third party test to see what was what. We could try near time clamatology by digging out some clams from the location of the disputed raobcores. Or we could get some coral (Sr/Ca proxy) to figure out the sst. Alright That’s all I have. agreed, however, as measurements were predominantly made with buckets until at least the 1970s and intakes became the dominant method only in the 1990s, this upwards corrections should continue until the 1970s and taper off in the 1980s, 1990s. and you will get the maximum in the early 1940s and 60 years of cooling since then. ICOADS datasets include adjusted, quality controlled, and infill data. Why, when the modern data sets are way more complete than in the 70s, with better understanding of problems, is some old graph patched together by a magazine, seen as a serious thing to compare to current records? Are we not trying to meet science with science here? And has anyone taken it upon themselves to audit the old graph? Or is there something special about it that makes it rise above scrutiny? Why am I comparing the 1970’s Budyko and Angell datasets to current datasets? Because the modern datasets have been altered by devotees of the AGW hypothesis. They are not data, they are that oxymoronic item, “adjusted data”. The older datasets are valuable because they allow us to see just where and how the modern datasets were adjusted. The old data shown above was not “patched together by a magazine”. It represented the best science of the time. I have given the references to the original studies in the head post. Take a read of them, they are very interesting. Do we understand the problems better now as you claim? Perhaps … and perhaps not. Given that the keeper of one of the three major global temperature datasets just had to step down from his job at the CRU because of his scientific malfeasance (conspiring to avoid releasing his data) and his inability to properly keep and maintain records, we certainly can’t assume that he understands the problem better than Budyko and Angell did in 1976. The difficulty is that the basic datasets of climate science, the global temperature databases, are controlled by people with an agenda. Their agenda is to convince the world that we need to act right now to prevent some imaginary disaster in fifty years … so you’ll forgive me if I don’t accept their adjustments as gospel. That old graph is important because it’s a snapshot in time to measure Hansen’s honestyn against a time when Jim wasn’t running the show. So far, it looks like he doesn’t have any. Even if a handful of raobcore in the tropics were faulty, even if the Ozone hole is causing the Antarctic to be especially cold (funny how NASA and Steig didn’t seem to remember that cooling with they’re “emo charts”), even if they decided to add in a couple points of “bucket heat”, Jimmy Hansen’s temperature line evolving from 1980 to 2007. These evens even if real were not settled or acknowledged until after, and yet there they be. Ang remember, Even Hansens 1981 graph dives strongly after 1959, so the epicentre of differences is not likely to be something just around 1960, the Stitch. “Some data in a magazine”. Please remember, the only reason that we have to look in these rather ancient (but peer reviewed high quality data) is that we know for a fact that data after these graphs has been modified thousands of time and allwas significant changes induce more warming/complience with IPCC viewpoints. The fact that “random” adjustment so extremely often unduces more heat and compliance with the IPCC point of view is one of the main reasons for the whole skeptic movement!!! Why am I comparing the 1970’s Budyko and Angell datasets to current datasets? Because the modern datasets have been altered by devotees of the AGW hypothesis. Are you certain the older records did not suffer adjustments? I was unable to find the raw data for the ’69 and ’77 papers. Can you direct me, please? – not only did Hansen alter the trend 1940-75, he also made a HUGE adjustment around 1975, much more warming trend. Excuse my failure to be more specific. It should have read The COADS data has not received to the pre-1941 Folland correction. “Likely” that the stitch is done wring by the Japanese Meteorological institute? This cliam appears without support. This bucket business is nonsense. I knew someone who handled them and it was an extremely haphazard process. To believe that we can accurately measure temperature from the tiny fraction of the oceans that ships covered 100 or more years ago is surely completely bizarre. To this day they continue to have little merit. Am I correct in presuming there is no data available for the older papers? And that we don’t know if those data were adjusted or not? Has anyone audited the older papers with the kind of diligence as the modern records are treated, or are the the older papers somehow immune to that level of scrutiny? As the hemispheric coverage seems to insufficient for the older papers, could the difference be put down more to better coverage? The data sets grew in size throughout the 80s as more stations were incorporated. The practice of radically adjusting data is more modern. I was unable to find the raw data for the ‘69 and ‘77 papers. Can you direct me, please? As with many older (and newer) papers, it doesn’t exist or can’t be found. So what I do is just digitize it from the graphs. I’ve put it on line ‘specially for you here, we’re nothing if not a full service website. Oh, please. Your tone and implied accusations are so unpleasant. We just got notice of these papers, and you want them audited already? Fine … go audit them. I’ve done my part, what are you waiting for? As the hemispheric coverage seems to [be] insufficient for the older papers, could the difference be put down more to better coverage? The data sets grew in size throughout the 80s as more stations were incorporated. 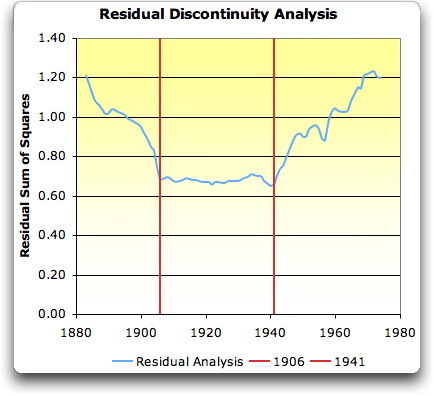 1) The residual discontinuity analysis shows a clear discontinuity in both 1906 and 1942. 2) Changes in the ’80s wouldn’t affect a paper published in the 70’s. 3) I would be very surprised if many new station records that were not known about in the 1970s have been “discovered” since then. If we can leave the discussion on tone aside, I am curious about the standard applied to the old data sets. There is an assumption that they are a good benchmark and that the data had not been manipulated by the authors. Why? I have read the recent posts on your site, Frank. I notice that there are discrepancies between the older temp profiles (fig 8) . Should this not make us wary of according them gold standard? Has anyone compared the current global temp record from Japan with Budyko and the rest to see if a modern, independent temp record corroborates Budyko or GISS/HadCRU? I believe the Russians also produce one. It would be good to see how it all lines up. I will try to find the Japanese and Russian modern temp records when I have time. I think they would be useful references. I was unable to find the data sets for the old papers and inquired after them here. It appears no one has seen them, and that “digging up old data” actually means finding old graphs. We just got notice of these papers, and you want them audited already? Not at all. My point is – if they haven’t been audited, how can such bold claims be made about them? Isn’t this the opposite standard to the one we’re trying to promote? Willis, thank you kindly for the digitized data. More than welcome. I’m working on a Mac, and I use a program called “GraphClick”, which makes the digitizing fairly easy and very accurate, but it’s a slow manual process … there’s assuredly something similar for PCs. What “bold claims” have I made about the older data? For now, we have “Mathews 76” that is based on peer reviewed Budyko, peer reviewed Angel and Korshover, and these have been stitched by the japanese meteorolgical institute, and we can see that other papers, including peer reviewed Yamamoto 75, is confirming the stitch. We see that the Stitch is not really violating the Hansen 1981 graph, and we see data backed up by High qualitu Raobcore. So for now, these findings are as promising as you could possibly ask for, honestly. “Gold” std. The “Gold´ish” about these data are that they appear high quality and BEFORE the ages of the big corrections. This is in it self “GOLD”. Then compare with CRU, accused of cheery picking in Russia, Australia, Scandinavia and many other places, a CRU WHO CANT FIND THEIR DATA. So when I compare, if any of the sets are “gold” I would prefer Budyko/Korshover/yamamoto/raobcore rather than CRU. But still you can find something not perfect if this is what we are looking for. 1. The step adjustment assuming a sudden switch from non insulated buckets to intakes is false. A predominant use of intakes is only since the 1990s. This means, there was no justification to adjust and reduce the large temperature increase in the early 1940s by a step function. This means also, that climate models are not able to explain this increase. 2. The temperatures from 1942 to the 1990s should be adjusted according to the use of the 3 or 4 measurement types. The problem is, that the percentages appear to be not well known, however, it is quite clear that the correction would increase the earlier portion and taper out in the 1990s. This means, that the measured temperature increase in the last 70 years would decrease or possibly disappear. How did you ascertain that the values are raw, and not adjusted temps for the old papers? Is it not possible that, for the period in question, the ‘adjusted’ temps might simply be (partly or wholly) the result of more data being added from a greater number of NH stations? What is the coverage like for the old papers? On this blog the argument has been made that even the modern record does not have enough coverage (eg, Bolivia) and therefore does not represent global temps well enough. How does this jive with records of poorer coverage? In effect you are arguing that the records are more accurate simply because they are pre-CRU, not because their intrinsic worth has been tested. Rather than asking the question, “how reliable are the old records compared to the modern ones,” you are working the assumption that they are more reliable. I think that some necessary skepticism is missing here. There is a modern Japanese temperature record. Has it been checked against GISS, CRU and the older records? That would be a worthy comparison. The Russians also have a global temperature record. (I don’t know how to access these). Would it not be worth seeing if greater coverage for these records in their modern form (particularly the Japanese global record) has resulted in a different profile? Sorry, meant to say ‘Japanese NH’ temp record (preferably land stations only). One last question before bed. I noticed in the top post you are comparing with GISS NH land-ocean data. Is the older data land-ocean, too (excepting the radiosonde record, which appears to be global). ?